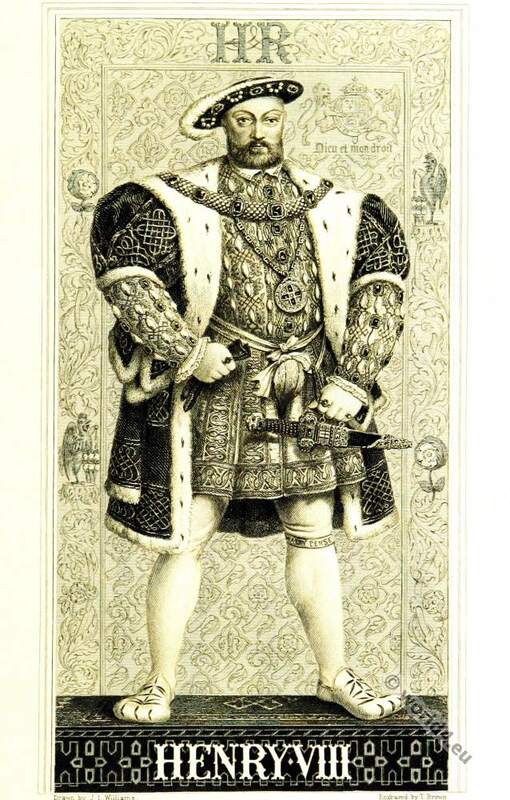 The character of Henry VIII. THE GREAT HARRY. Henry VIII. Tudor 1491-1547, was from 1509 to 1547 King of England, from 1541 King of Ireland. Henry VIII. was the first English king with a Renaissance education, he spoke several languages, wrote poems, composed music and showed great interest in religious themes. In popular culture, Henry VIII is. mainly known for his six marriages, two of which with divorce and two ended with the execution of the respective Wife. 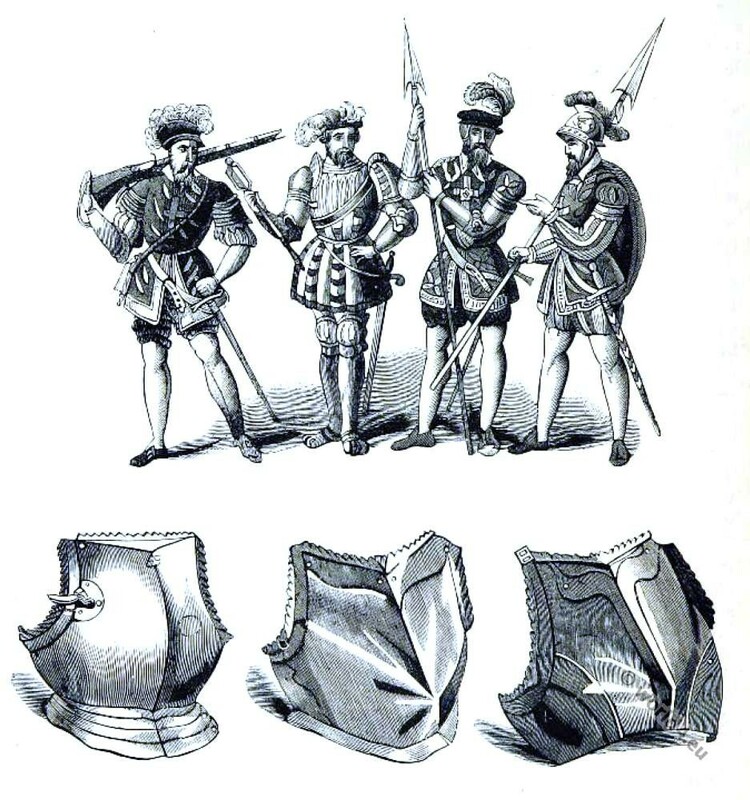 At Henry’s death the Crown initially fell to his nine year old son Edward, by his early death to his daughter Maria and finally to his daughter Elisabeth, with the house Tudor ended in 1603. Few studies are more difficult than that of the history of England in the fifteenth and sixteenth centuries. It is necessary to consider occurrences in relation to many events that preceded or were to follow, rather than to accept without question the opinions and declarations of those who recorded them; and it is equally necessary to learn, what were the particular circumstances which swayed each historian in his estimate of the character of the monarch, priest, or statesman who bore rule and made an indelible mark in the chronicle of the time. Yet strange to say, there appears to be but one opinion of the character of Henry the Eighth during the early part of his long and impetuous career. Even now we are accustomed to speak of him, not without a kind of unwilling admiration, and as though he still lived. No English king seems to be more real to us. We resent the tyranny and arrogance that darkened a splendid period, the inconsequent fury that was associated with the later cruelties of statecraft, the misgoverned policy that subjugated marriage to kingcraft, and placed the headman’s block behind the throne, and the axe beside the altar; but there is still something within us, by which we can understand how London citizens and English yeomen regarded Prince Harry of Greenwich the very example of English chivalry and youthful vigour:—that young King Henry the magnificent and accomplished monarch, who for many anxious years was a true lover and faithful husband,—a model of knighthood, of manly prowess, and even of such Christian virtues as few princes of his time displayed. At eighteen he had no peer in Europe, either for beauty, strength, or stature, certainly none for learning or for art. His fair face, golden hair, and bright blue eyes, added to a huge and stalwart frame, would have distinguished him anywhere, even if his great height had escaped notice. At every sport he was master of other men, and tired even the sinewy knights, and men-at-arms, by his endurance and vast personal strength. In wrestling or at tournament, in the chase or at the butts,— where he bent a bow that few of his archers could draw,— he approved himself a man, though he retained the freshness and the ingenuous looks of boyhood. The Venetian Pasqualigo said, “He had a round face, so very beautiful, that it would have adorned the person of a pretty woman.” And Sagudino, another keen and curious envoy, who was sent by the Doge to watch events and to describe the king, said, that when he was mounted on his charger, which he rode with a perfect skill,” he was like Saint George himself.” But Henry VII. was a father who took care that his children should be trained not only to arms, but to learning and to arts. Arthur, the eldest, was a pattern of grace and mental culture; but his frame was not robust, and his early death, when his widowed bride Catharine of Aragon was little more than a child, and the boy husband and wife were nearly strangers to each other, and did not even speak a common language, left to Henry of Greenwich the foremost place. He was able to sustain it by mental as well as personal prowess. That he understood and could speak and write Latin and Italian may be proved from the records of his talk, and by written letters to Erasmus, to Francois, and to Marguerite of Austria. At a later date he learned to speak Castilian for Catharine’s sake. A master of music, according to the testimony of Italians who were themselves proficients, he could play on the virginals and the organ, and could sing at sight. His compositions are still to be heard, anthems and church music which he conducted himself in the Royal Chapel. He could write a ballad too in quaint verse, and set it to an air, that he might sing it as he lolled in the royal barge, or beneath the trees in the park. In the theology of the time he had unusual knowledge, and turned it to account in his denunciation of Luther, as well as in essays on canonical views of marriage. He was also a skillful engineer, and had a special and remarkable talent for shipbuilding, and making roads and bridges. Amidst all these accomplishments, and the many weighty cares that press upon the man who will be king in fact as well as name, he displayed a rare talent for seizing and enjoying hours of leisure, for organizing games and jousts, and giving a kind of royal splendor and artistic pageantry to common sports and popular pastimes. 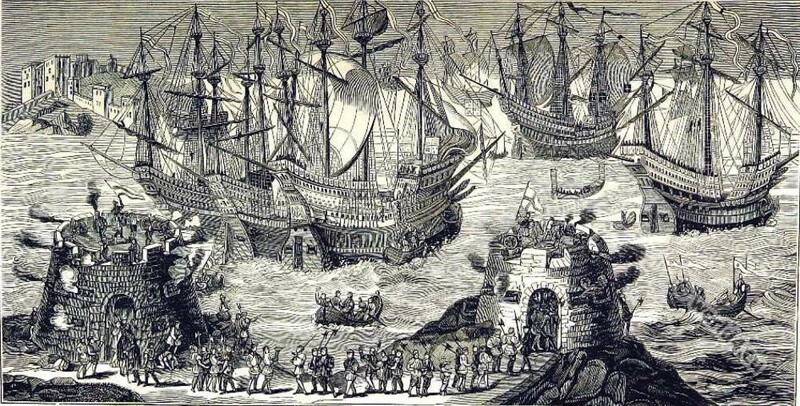 Henry VIII embarking at Dover. Henry VIII and his fleet setting sail from Dover to Calais on 31 May 1520 on the way to meet Francis I at The Field of Cloth of Gold. To all these varied gifts and rare attainments Henry united a healthy moral character and devotion to religion. Churchmen regarded him, indeed, as the fit successor to that title of “Defender of the Faith” which had been bestowed on his father. Seldom had a young man been seen who exhibited so consistent and ingenuous a delight in gay and innocent pastimes, with so genuine an aversion to vice and so deep a respect for piety. His celebrated song, “Pastance with Good Company,” was held to express his opinions on the rule of life. He had composed it, and set it to music, and it may well be preserved as a good old English ditty, worthy even of a prince, who himself was essentially English. So God be pleased, this life will I. But everyman hath his free will. It is a very terrible reflection that so promising a youth should have deteriorated into a manhood like that of the “Defender of the Faith,” who became persecutor, tyrant, and extortioner, while all his social relations were profaned by cruelty, and an arbitrary temper which gives good reason for doubting his sanity. One can scarcely examine the character of Henry without coming to the conclusion, that an originally active and even sensitive conscience, perverted by selfish ambition and gross indulgence, led to a diseased self-consciousness. 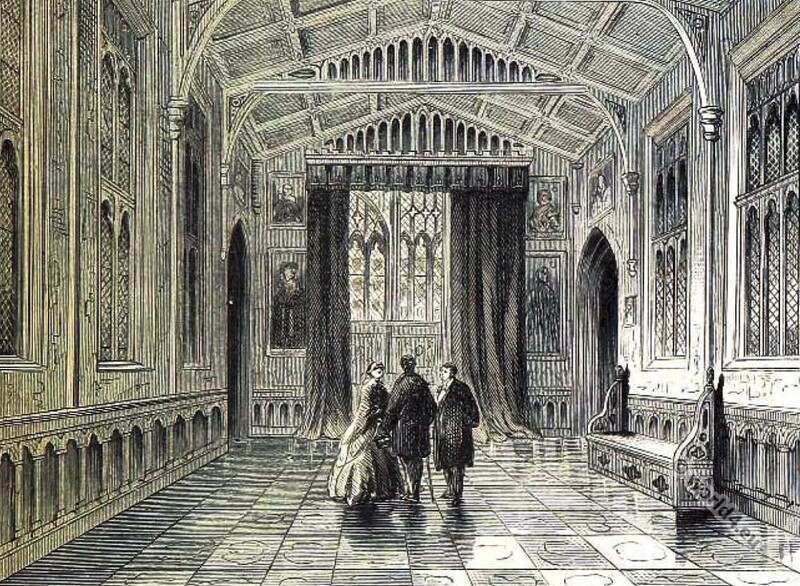 Trial of the marriage of Henry VIII. 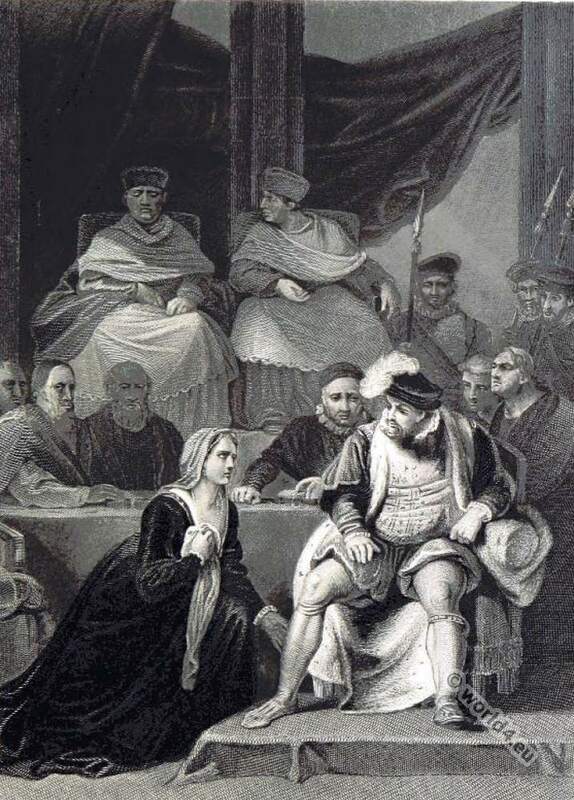 Left: Queen Catharine of Aragon pleading her case against divorce from Henry. Back: The archbishop of Canterbury. The bishops of Bath and Lincoln, the abbot of Westminster, and Doctor Taylor, Master of the Rolls, Stephen Gardiner. His early marriage with his brother’s widow—though it was declared to be legal, because she had previously been a wife only in name—may have been afterwards regarded by him with some doubt, in spite of the dispensation which he used all his powerful influence to obtain; but it was not till Catharine had grown old, and his policy was in danger, because of there being no heir to the throne, that~he repudiated it. Place of meeting between Henry VIII. and Anne Boleyn at Greenwich Palace. 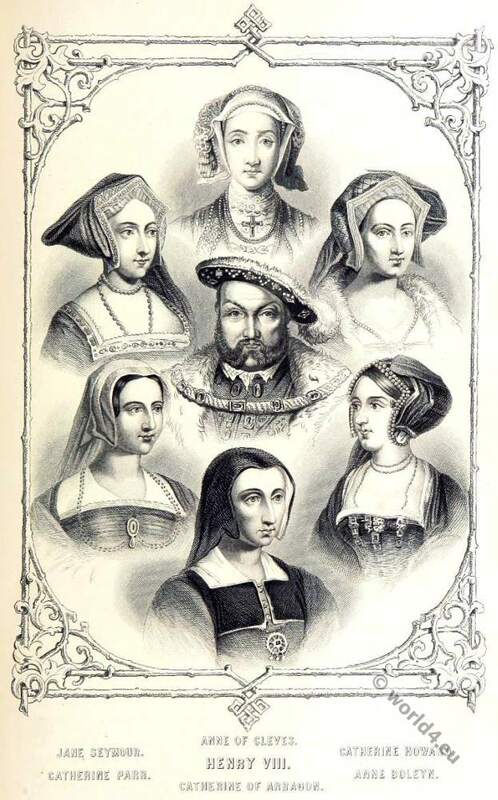 That no heir was born to him and survived, was attributed by the opponents of the marriage to a signal divine judgment, and it is possible that Henry himself may have come so to regard it; but the history of his first acquaintance and subsequent marriage with Anne Boleyn gives little reason for the opinion that he was altogether sincere in his professions of remorse; and the fate of Anne herself, his brutal indifference to her death, and the jealous fury with which he seemed to be afterwards haunted, appear to be the result of a mind and temper overthrown by arrogance, and weakened by false counsellors and sycophants, who were in continual dread of those fits of rage, during which their own lives were in danger. Henry VIII. Clockwise from Head. Anne of Cleves. Catherine Howard. Anne Boleyn. Catherine of Aragon. Catherine Parr. Jane Seymour. It has been well observed that we cannot estimate the character of Henry VIII. without reference to his magnificent bodily organization. In the youth and prime of his life, when health was strong and every wish appeared to be within his reach, the higher and nobler features of his character predominated, and his truly royal presence represented a truly kingly character. When the strong physical constitution gave way, and disease and bodily incapacity superseded the health and activity of his prime, his manliness degenerated into grossness, his self-confidence and self-will into tyranny, and his boisterous temperament towards brutality. Cardinal Wolsey at Leicester Abbey. The strong individuality of the king, and his exaggerated self consciousness, gave effect to the entire government. The nation alternately gained and suffered from the alterations in the passions of its head. 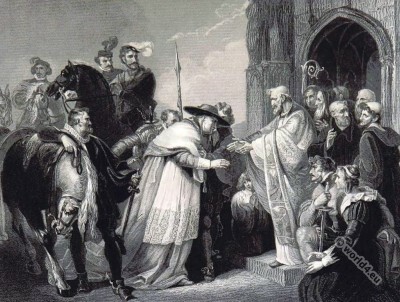 As long as Wolsey lived and stood at the right hand of Henry as his confidential and trusted adviser, the evils of this too great personal government were to a great extent moderated. Wolsey fell in order that the government might have in the eyes of the world but one presiding will; but the confidence withdrawn from Wolsey was never again bestowed on any minister. Thence forward the policy was that of Henry alone, and with its intensified personality came a long train of attendant misfortunes. The fire of his will was fierce and unquenchable even by his own better instincts. The absence of a matured and thoroughly disciplined mind, often gave an appearance of inordinate and reckless passion and cruelty to what was really little else than a spasmodic attempt on the part of a strong will to escape from the consequences of its own unwise acts. 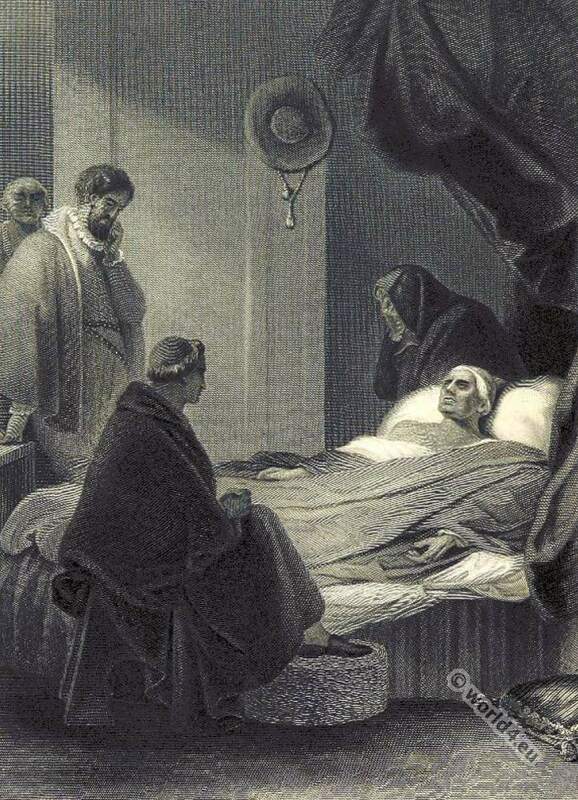 The death of Cardinal Wolsey. With the nation the case stood thus. The people had the right and the means of resistance to his will, but they scarcely even resisted or wished to do so, till at last if they had wished they had lost the courage to act. The king had practically the power to be a tyrant, but with the nation at large he preferred being an idolized autocrat (Sanford, Estimate of English Kings.). Considering that he was the very model of what was then regarded as manly strength, that his affability and good humor were proverbial, and that he represented to the people not only a king but a champion, it is not wonderful that he should have attained such a position. The Venetian envoys at the English court said in their reports to their own government— “His majesty is twenty-nine years old, and extremely handsome. Nature could not have done more for him. He is much handsomer than any other sovereign in Christendom, and a great deal handsomer than the King of France: very fair, and his whole frame admirably proportioned. On hearing that Francis the First wore a beard, he allowed his own to grow; and as it is reddish, he has now got a beard that looks like gold. 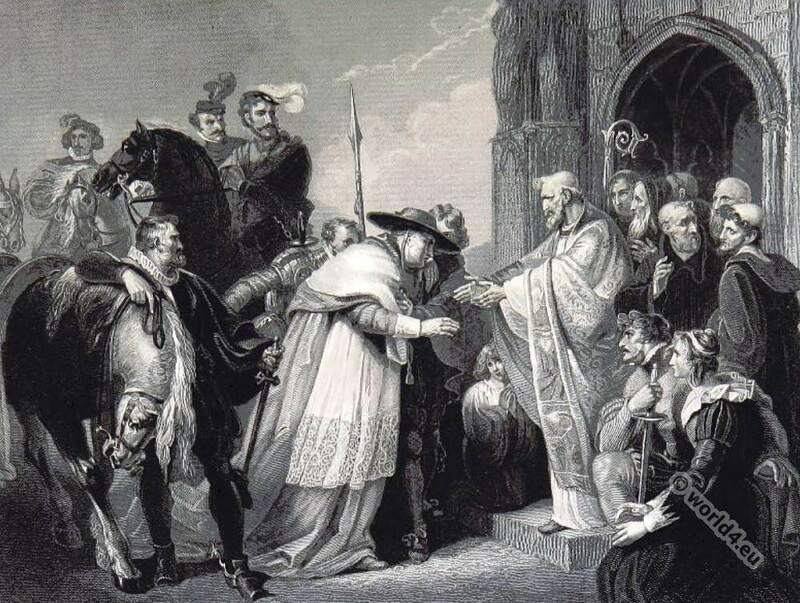 He is very accomplished; a good musician; composes well; is a most capital horseman; a fine jouster; speaks good French, Latin and Spanish; is very religious; hears three masses daily when he hunts,and sometimes five on other days. He hears the office every day in the queen’s chamber, that is to say vespers and compline. He is very fond of hunting, and never takes his diversion without tiring eight or ten horses. He is extremely fond of tennis, at which game it is the prettiest thing in the world to see him play, his fair skin glowing through a shirt of the finest texture” (Giustinian). These are the portraits of Henry in his youth, and before the dark times when, heavy of body and brutalized in temper and disposition, he had begun to think of consoling his widowhood after the death of Jane Seymour—by making an offer to Anne of Cleves. Holbein was despatched to the court of the duke to paint a portrait of the lady, so that we are not totally unfamiliar with her features. The picture came to Henry in an ivory box, which represented a rose so delicately carved as to be said to be worthy of the jewel it contained. Unhappily either the ivory box and the setting captivated the king, and gave a fictitious beauty to the portrait, or the painter had deceived him, or the original was not to the taste of so inconstant an admirer; who, when he saw his consort at Rochester, whither he had gone to meet her, was so bitterly disappointed that he scarcely stayed to give her greeting. Furious with the ambassadors, and still more so with Cromwell, who without knowing the lady had promoted the match, Henry called a council at Greenwich, and there, after abusing the minister and delicately referring to the royal bride as a “great Flanders mare,” commanded Cromwell to devise some pretext or plausible cause for preventing the conclusion of the marriage. It does not appear, however, that Anne of Cleves was an ugly princess, and the king, who was himself very gross and heavy, had been expressly desirous of marrying only a fine, large woman. Perhaps Anne was on too large a scale—at all events, the fickleness of the overgrown lover was manifested by his being afterwards so quickly attracted by the little Lady Catherine Howard, who was below the ordinary stature. Among the relics of the reign of the Great Harry the Holbein portraits are the most suggestive. That of Henry himself has been painted alike by artists and by ambassadors. In the words of one of the latter may be best described the magnificent dress of the king, when he was holding high state in the prime of his life and prosperity. Such was the appearance of the Great Harry, and though we are perhaps less impressed than surprised at the gorgeous brilliant figure, it is evident that all this sheen of gold and jewels was an important, if not a necessary accompaniment of state occasions, or the writers would scarcely have dwelt on it with such admiring attention to details. Sir Thomas More, councillor to Henry VIII, Lord High Chancellor of England. Queen Elisabeth knighting Drake on Board of the Golden Hind. This entry was posted in 16th Century, England, Renaissance, Tudor and tagged English history, Pictures and Royal Portraits, Renaissance fashion era, Tudor period on 6/10/15 by world4.